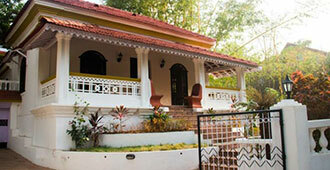 This heritage resort is located 4.5 kms from Sangolda Panchayat and Calangute Beach. It has 12 bungalow-style air-conditioned rooms and two suites to choose from. Moonfish - a sea-food restaurant, Madeira - a Continental dining outlet make up the gastronomic section of this resort. Guests can also enjoy a wellness session in the state-of-the-art gymnasium.